We will be looking for a change of luck for the talented Sound Works at Canterbury on Wednesday, the well related Not A Single Doubt filly having had nothing go right when she was resuming at the same track a week ago. "It is not usual for us to back them up a week after their first up runs," Michael Moroney said, "but she really didn't have much of a run, she never got a go at them." Badly held up for runs in a small field, Sound Works went to the line hard held that day, finishing second last but beaten less than two lengths. Nicely drawn in barrier four for Christian Reith in the TAB Rewards Plate, Sound Works is a filly we have always had plenty of time for. 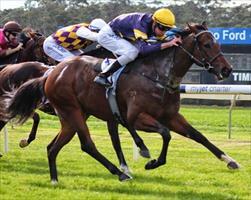 "We think she is stakes class so she should be able to win a race like this," said Moroney. To Victoria where we have two midweek runners, the first of whom is Lord Barrington who contests the Catanach's Jewellers Plate at Sandown on Wednesday. To jump from barrier two for Jordan Childs, the consistent four-year-old rises in class off a tough Ballarat victory but has been going well. "Any rain about would help him but he is nicely drawn and he is always thereabouts." On Thursday Cape Londonderry steps up in distance in the Racing.com Handicap with Jake Noonan riding from barrier six. Fitter for his last two runs including a last start Warrnambool fifth over 1600m, the son of Pentire is nicely primed for the 2200m. "He is just about at his top now," Moroney said about the lightly raced three-year-old whose maiden victory came at 2000m late last year.